Richard Etchberger was born on March 5, 1933, in Reading, Pennsylvania. He enlisted in the U.S. Air Force on August 31, 1951, and after completing basic training he was assigned to the Airman Electronic Fundamentals School and Radar Maintenance School at Keesler AFB, Mississippi, from 1951 to 1953, and was trained as an Auto Track Radar Specialist. 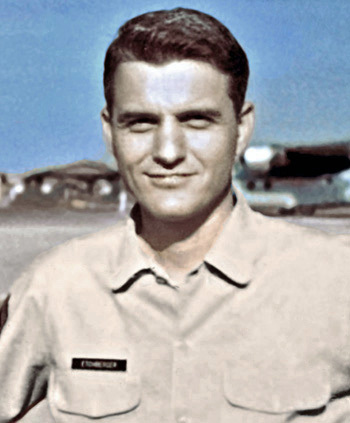 Amn Etchberger was accepted into the Aviation Cadet Program in 1953, but later left the program and returned to the Radar and Communications career field. He was next assigned to a detachment of the 3933rd Radar Bombardment Scoring Squadron at March AFB, California, and then served as an Auto Tracking Radar Technician with the 11th Radar Bomb Scoring Squadron at Hill AFB, Utah. He served in Morocco from January 1958 to November 1961, and then served with the 11th Radar Bomb Scoring Squadron at Bismarck, North Dakota, from November 1961 to August 1965. Sgt Etchberger deployed to Clark AB in the Philippines in August 1965, where he served as NCOIC of Radar Maintenance with the 5th Tactical Control Group from August 1965 to June 1967. 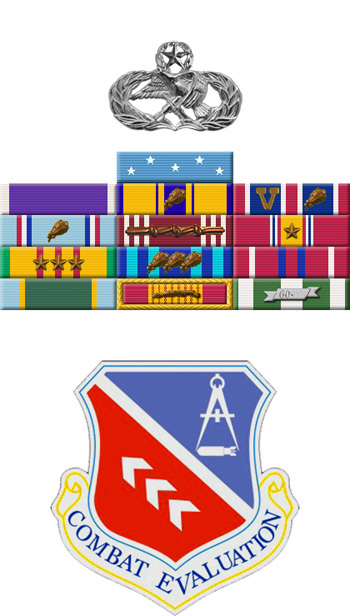 His next assignment was as NCOIC of the Electronics Branch with the 2865th Ground Electronics Engineering Installation Agency at Chanute AFB, Illinois, from June to October 1967, followed by service as a Ground Radar Superintendent at Lima Site 85 in Laos from October 1967 until he was killed in action at the site on March 11, 1968. CMSgt Etchberger was buried at the Saint John's Cemetery in Hamburg, Pennsylvania. He was originally awarded the Air Force Cross in 1968 for his heroism defending Lima Site 85, and it was upgraded to the Medal of Honor in September 2010. For conspicuous gallantry and intrepidity in action at the risk of his life above and beyond the call of duty. Chief Etchberger and his team of technicians were manning a top secret defensive position at Lima Site 85 when the base was overrun by an enemy ground force. Receiving sustained and withering heavy artillery attacks directly upon his unit's position, Chief Etchberger's entire crew lay dead or severely wounded. Despite having received little or no combat training, Chief Etchberger single-handedly held off the enemy with an M-16, while simultaneously directing air strikes into the area and calling for air rescue. Because of his fierce defense and heroic and selfless actions, he was able to deny the enemy access to his position and save the lives of his remaining crew. With the arrival of the rescue aircraft, Chief Etchberger, without hesitation, repeatedly and deliberately risked his own life, exposing himself to heavy enemy fire in order to place three surviving wounded comrades into rescue slings hanging from the hovering helicopter waiting to airlift them to safety. With his remaining crew safely aboard, Chief Etchberger finally climbed into an evacuation sling himself, only to be fatally wounded by enemy ground fire as he was being raised into the aircraft. Chief Etchberger's bravery and determination in the face of persistent enemy fire and overwhelming odds are in keeping with the highest standards of performance and traditions of military service. Chief Etchberger's gallantry, self-sacrifice, and profound concern for his fellow men at risk of his life, above and beyond the call of duty, reflect the highest credit upon himself and the United States Air Force.